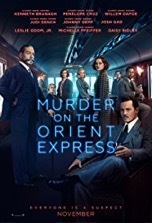 The standard opening would say something like: “Based on the novel by Agatha Christie…” In this case, it’s more accurate to say: Loosely based on the novel of the same name by Agatha Christie, Murder on the Orient Express is a modern retelling of Christie’s seminal mystery yarn. Much to its detriment, this version of Christie’s magnum opus is more concerned with casting Hercule Poirot (Kenneth Branagh) as a superstar sleuth in the mold of Sherlock Holmes than as the humble, working man’s detective from the source material. The “loosely” argument is bolstered by the fact that director Branagh makes several significant alterations to the literary classic, the first of which comes during the movie’s opening when Poirot solves a mystery in the style of Holmes. Unfortunately, the case is exceedingly conventional and the specifics are muddled. We have no interest in the people involved in the whodunit since we just met them and could care less about the caper itself because we have no investment in its outcome. The whole sequence is gratuitous since it was designed solely for the purpose of demonstrating how marvelous a detective Poirot is…which we’ll figure out anyway once the titular murder has been committed. These are wasted minutes that could’ve been used for developing back stories or laying out the details of the homicide—both of which are cursory to the extreme in Branagh’s Murder. The procedural elements are breezed through—the clues (handkerchief with an embroidered H, pipe cleaner, broken watch and, later, scarlet kimono) are discussed in less than 30 seconds and the specifics of the murder (i.e., number of stabs, where and how severe the blows were, etc.) only take up about a minute of screen time. So what does Branagh spend the balance of the film on? Good question. It certainly isn’t on character development. Indeed, we get to know these train passengers far less than their counterparts in Sidney Lumet’s version of Murder (1974). That iteration of Christie’s book also had a decorated cast (Albert Finney, Sean Connery, Vanessa Redgrave, Michael York, Ingrid Bergman, et al. ), but it could be argued that individuals in that movie were two-dimensional too. Branagh spends a few minutes of screen time on establishing shots of the train rolling along the European countryside. It’s a nice add since the technology didn’t exist in the 70s to create these sweeping, aerial landscape shots. However, the double-edged sword of technology is that it draws attention to itself. Here, our first impression is, “Wow, gorgeous vista,” and then our second thought is, “And it’s been rendered to death by CG artists.” As for the cinematography, Branagh makes the most of the cramped train set by using clever camera angles. Branagh employs a high angle shot twice—once when the body of loathsome Ratchett (Johnny Depp) is discovered and then during the examination of the corpse. One instance would’ve been sufficient, twice is overkill. Plus, both shots are long takes, which are more enjoyable for their artistic achievement than for their viewing pleasure. Another “loosely” item is the scene where Arbuthnot (Leslie Odom Jr.), who’s a doctor instead of a colonel in this rendition, shoots Poirot. Though his motivation is to protect Mary (Daisy Ridley), the good doctor earlier averred that he couldn’t harm a fly. This is the kind of inconsistency that drives Poirot, and savvy spectators, mad. Of course, the shooting serves the story as both a red herring and an action interlude, so its inclusion is understandable, if unacceptable. The next scene also has plenty of new material in it. For starters, none of the characters leave the train in Christie’s book. Here, all of the suspects sit at a table (where did it come from?) inside a train tunnel: the obvious visual antecedent here is da Vinci’s “The Last Supper.” This is the setting where Poirot solves the case, albeit in a less streamlined and cogent manner than in the book and earlier film. In particular, the two possible solutions aren’t explained very clearly. A compelling new scene involves Poirot offering himself up as a sacrificial lamb so that the guilty parties can go free. Poirot places a gun on the table, which affords the conspirators an opportunity to silence him. In a shocking twist, Mrs. Hubbard (Michelle Pfeiffer) grabs the gun and tries to off herself. Though not without entertainment value, this story embellishment falls flat when we learn that the gun is empty, making the whole sequence a pointless exercise, other than to generate some faux tension. Once the case has been solved and the train freed from the snow drift, the movie should come to an end. But the denouement is dragged out so that we can observe Poirot heading off to his next case—again, it’s obvious, and somewhat pathetic, that Branagh is so determined to portray Poirot as an in demand, top-shelf detective when he knows that the Belgium sleuth carries none of the clout or name recognition (at least in America) as Holmes, Spade, Marlowe or Hammer. Michael Green’s adaptation of Christie’s book is disappointing on so many levels there isn’t even a word to describe how poor his efforts are. Everything in the plot is done hastily. Like a runaway train, the story steamrolls along to its inevitable, predictable resolution. The elegance of Christie’s tale is in how it selectively dispenses clues and gradually reveals the motivations of its diverse, yet unified, characters. All of this is lost in Branagh’s Murder, which, in the end, is just a Reader’s Digest version of Christie’s masterwork. Murder’s expedience is its undoing. That’s a bitter reality since the film wastes a fine central performance by Branagh (which is much more enjoyable to watch than Finney’s, in my opinion). It’s also sad that the considerable talents of the rest of the spectacular cast were wasted on such perfunctory material. Ironically, that’s an even bigger crime than the one committed in the movie.